A beautiful overture to Africa uniting a romantic escape to the Seychelles with the perfect luxury safari in Cape Town and Singita Private Game Reserve. Your safari experience: Stop over in Cape Town and its lovely vineyards for some of South Africa’s best sightseeing, wine tasting and great French restaurants. Then, fly up to the greater Kruger region for a safari in the private Singita Lebombo game reserve. Stylish and contemporary safari accommodation is offered with all the creature comforts to ensure a quality wilderness experience. Twice-daily guided safaris with professional guides bring you close to all of Africa’s large mammals and offer excellent birding. Game walks offer thrilling close encounters with game and provide ample opportunities to experience the bush at close hand. 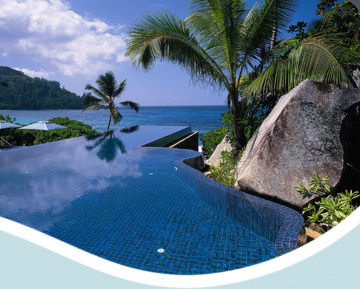 Finally, after your exhilarating safari experience, take some time off at the luxurious Banyan Tree beach resort in the Seychelles, situated on the main island of Mahe. Your private beachfront villa with in-room plunge pool offers exclusive indulgences and open vistas to enjoy beautiful Seychelles sunsets. One of the world's most beautiful cities, Cape Town is a natural spectacle in an enchanting corner of South Africa. Experience trendy nightlife, beautiful sightseeing and world-class hotels and dining in the vibrant Cape. The Ellerman House is a boutique luxury hotel in the elite suburb of Bantry Bay, perhaps the most exclusive and greatest of all luxury hotels in South Africa, yet it remains a secret hideaway. The service is uniquely distinctive, surpassing every luxury Cape Town hotel in quality, exclusivity of location, excellence in service and renowned standard of luxury. A fine luxury home in Cape Town, Elleman House has blossomed under the care and devotion of its original owners. Many gracious living rooms flow onto sweeping verandas and patios offering unsurpassed views across the Atlantic Ocean to Robben Island – a privileged pleasure also enjoyed from the private balconies of the exquisite Eleven suites in the House. Relaxation is also found in the stately reestaturant, bar and library, where guests enjoy the finest known private collection of antique and rare South African Wine and Art. The Ellerman House is one of only two Relais & Chateaux hotels in Cape Town and one of only 14 Purple shield-status hotels in the world. The elegant Ellerman Spa offers color-therapy steam bath, sauna, infinity pool and opulent massage treatments.